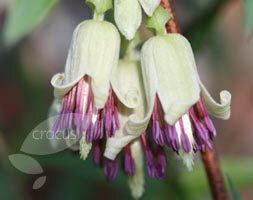 frost hardy (may need winter protection) A very rare and unusual form of Clematis that originates from Nepal and parts of southern China. It is a remarkable plant, that loses all its foliage in late spring or early summer and remains dormant throughout the hottest months of the year. In autumn it will put on lots of lush new foliage, followed by large clusters of flowers in early winter. The flowers themselves are quite unique, they are pendulous and scented and look like greeny-yellow bells that are filled with attractive red-purple stamens. After they fade large, fluffy seed heads develop, which can last for several months. Ideal for a sheltered courtyard garden or cool conservatory, where it is invaluable for creating interest during the darkest months of the year.